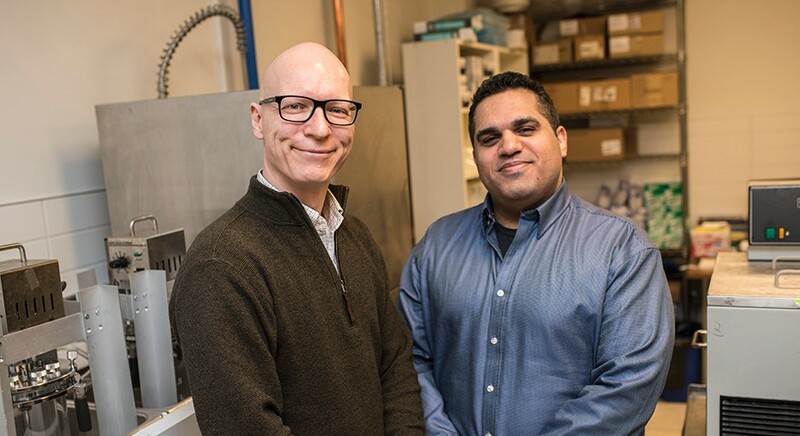 Dérick Rousseau (Chemistry) and Nick Bellissimo (Nutrition) are leading a cross-disciplinary team to explore the place where food science and nutrition intersect. Their work is looking to solve the age-old problem of creating satisfying yet delicious foods that will tide us over between meals and prevent weight gain. The duo are using reverse engineering to understand how foods and their components contribute to the cessation of eating and whether foods can be re-designed in a simple manner with everyday ingredients to make them more satiating. According to Rousseau, the Dedicated Ryerson University In-vitro Digester (DRUID) mimics different parts of our digestive system from the mouth to the stomach and small intestine. By adding compounds that imitate our digestive juices, the team’s research experiments can explore how the foods we eat are broken down and digested. The goal of their joint work is to examine what makes foods satiating, according to Bellissimo. “We are examining how foods break down in the gastrointestinal tract and the role of functional carbohydrates, proteins and fats on satiety,” said Bellissimo. In Rousseau’s lab, high-satiety foods are being more closely examined for their structure, using the DRUID to see where they are releasing their nutrients in the different stages of digestion. “We look at how the food breaks down and how the nutrients are released,” said Rousseau. In doing so, they can devise ways to restructure foods in order to make them more satiating. “In essence, we want to re-package existing ingredients to make a food that will make you feel fuller, longer,” said Rousseau. Meanwhile, in the Nutrition Discovery Labs, Bellissimo is able to corroborate findings from the DRUID to determine the efficacy of new foods and components in humans.